I lost my sweet Polly today. Her health had been getting progressively worse for about a week so I was able to see it coming and prepare myself. She would have turned 17 next month. She was SUCH a sweet and lovable cat. She loved being outside and she loved snuggling into the most random places which was always so entertaining for us. Even though I knew it was coming I am still very sad. I have had her since I was in the 8th grade and she was the first thing (besides a hamster or two) that I ever mothered. The joy that I found today was given to me by Ayden. Once I had discovered that she was gone I called Ayden over to me and told him I wanted to talk to him about something. I started to cry as I let him know what had happened and the sweet boy immediately gave me a hug. He asked a few questions, which I answered the best I could and then he got me a tissue and wiped my tears. He held me and told me he was sorry she had died. 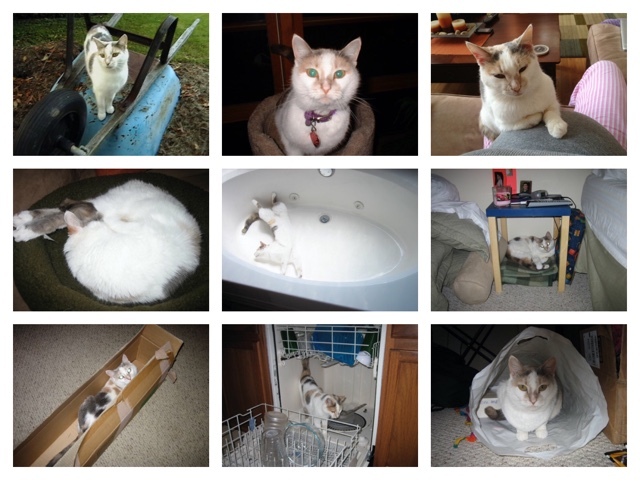 He was sensitive and empathetic and truly supported me as I grieved for my beloved cat. We involved him in the burial process and answered all of his questions honestly and to the best of our abilities. Though her last few days were rough, she handled them gracefully. Her last gift to me was to gently helping Ayden begin to understand this part of life without anything traumatic happening. He handled it in a way that I never expected. He was tender hearted and mature beyond his years. I will always be grateful to Polly for giving us a chance to teach Ayden such valuable lessons at such a managable level. And I am so grateful to Ayden for being a shoulder to cry on. Sweet, sweet Polly will be missed dearly. My childhood cat died at 17 as well.we had to take her to vet and put her down. We couldn't stand seeing her suffer. At least Polly died naturally, I assume. I admire your patience with 2 animals. I remember watching your YouTube channel way before ayden was born. I remember seeing polly climbing and walking on your kitchen counter behind you. I remember thing how patient you were not to get upset. I currently have a cat and cats have annoying behaviors such as that and its hard training them compared to dogs. Rip polly. She did die naturally in her sleep. I was SO glad I did not have to intervene and that she did not suffer too much. I know she did not feel well at all in the days leading up to the end but she handled it gracefully. She actually has had hyperthyroidism for about 4 or 5 years. It made her food obsessed at times and she literally couldn't stay off the counters. She was always on the hunt for food. We were patient sometimes more than others but we tried to be understanding. The vet finally adjusted her medication and those behaviors became much more manageable. I am so sorry to hear of your Polly's passing. It's always hard to say goodbye to a friend. What a sweet boy you have to help comfort you.